Of course I wish you a full and speedy recovery! Digging in your yard must be like digging for treasure. I love the idea that the Farmhouse family had kids who played with marbles and had tea parties. :o) Your blog posts have been missed. 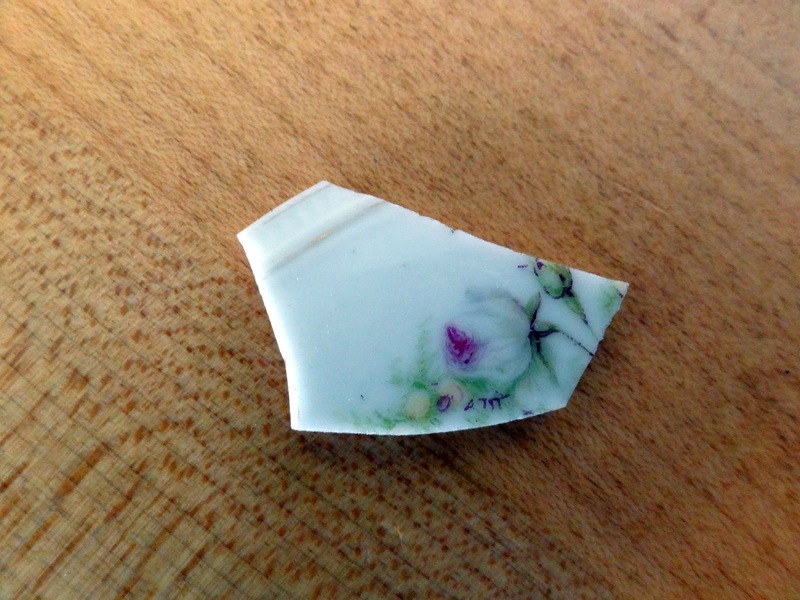 How interesting to find the pottery shards in your garden. My parents had an old Ontario log home and discovered what are called the nuisance grounds when they turned over soil to create a garden. This would have been the trash heap covered over in a time when your garbage didn't go to the curb. 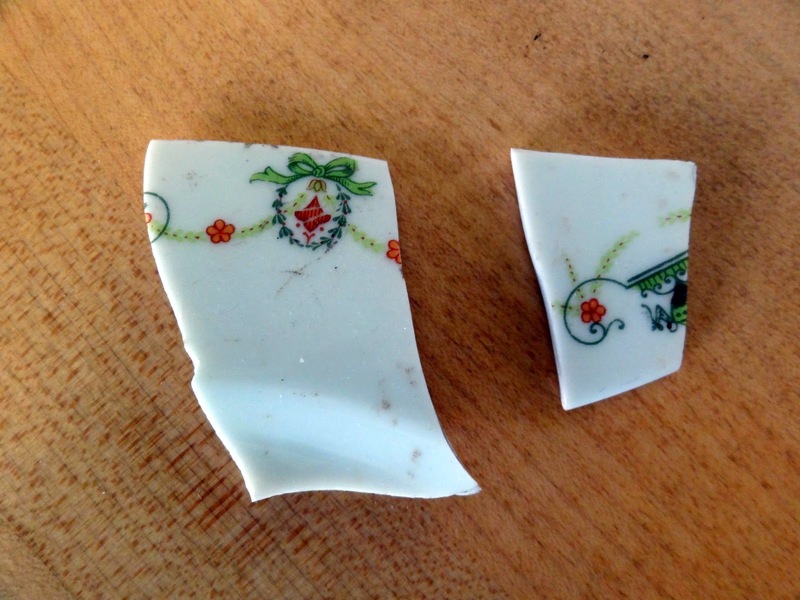 Like the pieces you found, they discovered broken pieces of pottery and sadly some fine china which we imagined had been brought from Britain with the early settlers. HI Candace! Hope the kitties (and Mr. Squash) are still taking good care of you during your recover! What interesting finds from your yard. Makes you wonder how/why they get there in the first place. Glad to hear you are recovering well. I'm sure Mr. Squash and the kitty girls are taking good care of you. Wishing you speedy healing! Sorry to learn that you have had back surgery. Having been through two myself, I feel for you! I hope it was successful. what fun discoveries! I love mysteries :) slow and steady is the phrase for recovery! Candace, glad to hear that you're on the mend. Take care of yourself, dear girl. We do miss you when you're absent. Give Gracie and Sasha a hug for me. I need a kitty hug right now. Welcome back Candace ! Missed you blogging and so glad to hear you are on the mend! Wishing you a speedy recovery ! Yes for sure I look at old things and think what might have happen here and there. I have a great imagination so i can dream all day long. I hope you are well on the road to recovery now and will soon be back to doing the things you love. What fun it must be to find such fun pieces. If only the pieces could talk to you!!!! I'm sure they would have great tales to tell. How fun to find little bits and pieces as you work the soil! I like the whimsy of your thoughts as you look at what has been unearthed. Speedy recovery to you! I wish you a very speedy and complete recovery! Sorry to hear you have been dealing with that, but what fun little treasures you have found. I like the stories you create to go with them. Thanks for sharing! Welcome back, Candace. You have been missed! I know years back...before the convenience of curbside trash pickup, farmers used to bury their household trash and I'm just wondering if that's what the treasures are that you're unearthing...bits and pieces from the past. I'm sure there's more lying undisturbed in the soil underneath your house and gardens. If only they could talk, huh? So sorry to hear you had to have back surgery, but so happy to hear of your recovery. May you continue to do well. I love your imagination! Oh, ouchie! I hope you soon are mended and feeling much better with good mobility. What fun to find treasures in your yard. I'm afraid I too am a hopeless romantic junkie, always looking for hidden treasures in the back yard. Be good and take care of yourself. Welcome back! I hope the pains go away as the weather gets warmer. - Nice finds in your garden! 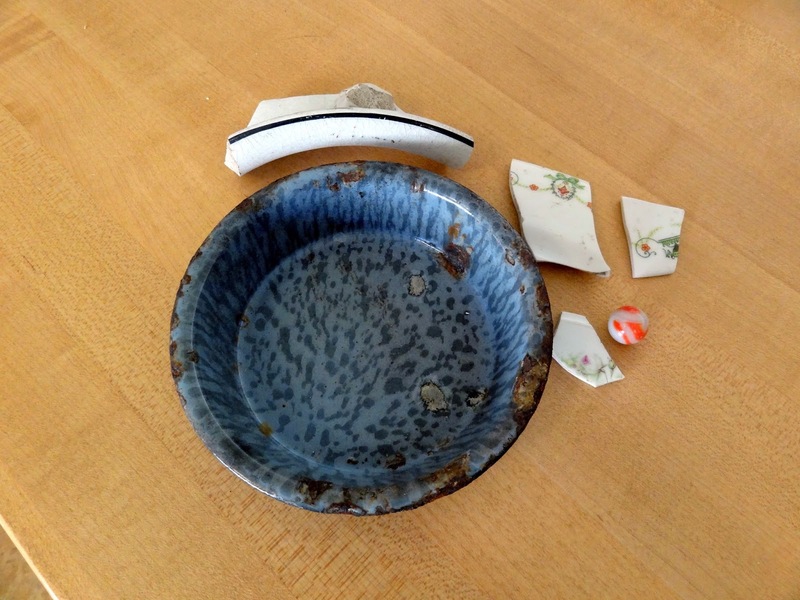 The must have buried the broken dishes as there was no other way to get rid of them. 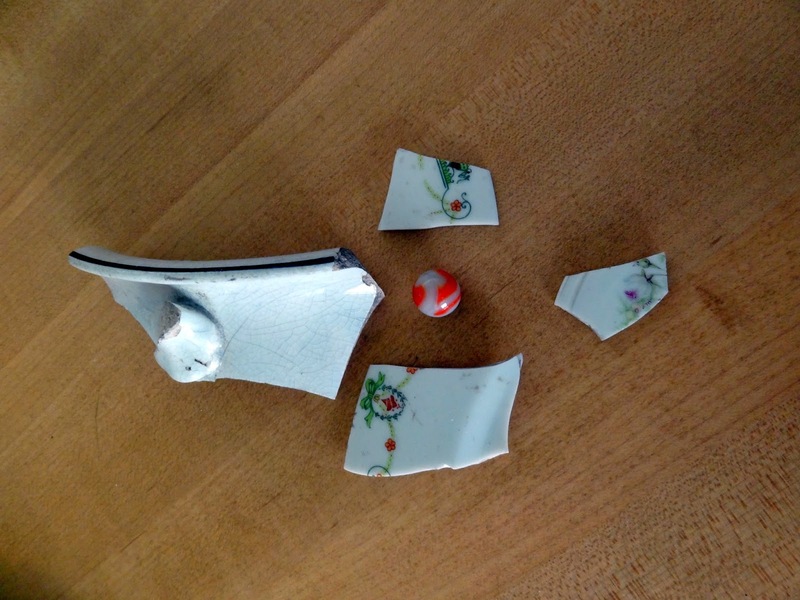 Our place was built 1947, and we have found an almost whole soup dish between some rocks, and a light bulb with the glass still intact but the metal rusted away. yikes! Hope your recovery is speedy! Dear Candace, nice to know you are recovering well from the surgery. I hope Spring is helping in your healing and bringing lot of cheer in the way of warm days and colorful flowers. Missed your cute stories. These are wonderful treasures, I will look forward to more of your lovely tales as you and Mr. squash discover new things in your yard. Glad you are feeling like blogging again. It's been a rough road, but you are sounding better and better. SO interesting the things you two have unearthed. I like to think of what the history of things like that is too. Hugs and keep on feeling better and better my friend!! Wishing you a complete recovery. When we lived in the Eastern Sierra ww were always finding arrowheads and once a very old digging tool guesstimated to be over 100 years old. A lot of these items were in the root system of trees cut down to build our home. Another find was an old mother of pearl button on the banks of the Owens River. I'm sorry you've been going through such a horrible time. Get well soon. Totally fascinating. Yes I think you are right about the ironstone piece being a serving dish. I have similar shaped ones for vegetables. I think they may have also had lids originally, so happy hunting for more. I love your scenarios about them. I do that too. I adored Mr. Squash's interview answers, and I am pleased to hear you're recovering from your surgery--a very big deal! Thanks for the background stories on the backyard finds!